Manu Larcenet's Ordinary Victories 2 is about a man trying to find his way in the world. Marco Louis was able to escape the lifetime of hard labor and the horror of war that his father experienced thanks to his skill as a photographer, but he had his own series of struggles to transcend. The two separate books that make up this collection see Marco struggling with the suicide of his father and later becoming a father himself. Marco's main struggle in life was in creating, building and sustaining connections. Becoming a photographer, in a sense, was a way to keep the world at a distance. In addition to simply being able to control the way the world looked in his camera, photography flattens its subjects, making them simpler to engage. Despite that tendency to have the mediating presence of a camera as his crutch for understanding the world, Marco had the eye of a poet; he couldn't help but capture the essence of people in his work. 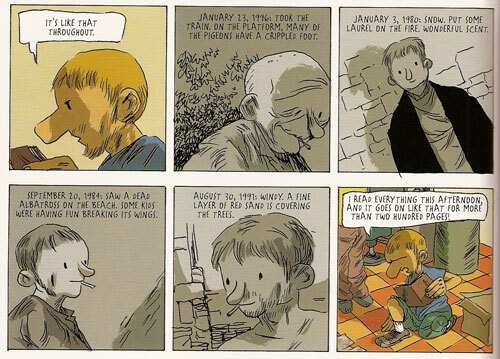 The first story, "What Is Precious", finds Marco dealing with the aftermath of his father's suicide. Trying to understand his father's life became his desperate mission for any number of reasons. What it boiled down to was "knowing who I am must come through knowing who he was". However, he's foiled in his attempts at understanding because his father left no easily interpreted clues as to what drove him. What's worse is that the journal he kept was used to record what seemed to be the most banal, trivial observations that seemed to have nothing to do with his life. There were no mentions of his feelings or (more importantly to Marco) his family. The other factor that drove Marco to try to understand his family was the pressure placed on him by his girlfriend, who very much wanted to have a baby with him. Marco panicked at this notion, partially because the idea of becoming a father started his mortality clock. The larger reason, he notes, is that doing so is "renouncing one's life as an imperfect man in order to become a fantasy figure who has no right to make mistakes." He then wonders, "Who was the man trapped inside my father?" After finding out some details about his father's time in the Algerian war, Marco starts to understand why his father had to "let beauty go and preserve what is precious", seizing upon the trivial as a way of staving off madness. Both of the stories in the book deal with transition. There is nothing static depicted in Marco's life, even in the quieter moments. Even as he rails, fumes and fusses about change, he finds ways to cope. That's because he learns how to communicate better, be it with his girlfriend, his mother or his therapist. 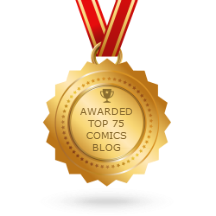 Larcenet contrasts Marco's process with those of other characters who don't fare as well, like his brother (who keeps his grief bottled up until he leaves his family and goes on benders) or his mother (whom he overhears spilling her guts to her dead husband at his grave site). While a lot of transition is painful, events like the birth of his daughter or the publication of his first photography book evoke feelings of enormous contentment and pride. The publication of the photography book is a key story element, because it was the most tangible way for Marco to establish a connection with his childhood. The photos were of the workers he had known all of his life: those who worked with his father. While his mother admonished him not to romanticize his "roots", his friend and photo subject Pablo noted, "When it's not hideous, life is wonderful". That sentiment pretty much carried over every day as Marco stumbled his way through fatherhood, having to learn a new kind of communication on the fly that was alien to him. The second story, "Hammering Nails", concerns that struggle amid the theme of abandonment. Once again, transition crops up, both in terms of Marco becoming a father and the workers being forced out of their jobs as the face of France changed. Fathers who walked out on their children are a running device in the book, and Marco himself was tempted more than once to escape. He doesn't seriously consider this though, and he realizes that one reason why is that his father is reflected back in him--and his father never left. He's become happier than his father because his art of photography has enabled to him take a certain poetic outlook on life, and he notes that "poetry is the only way to notice what is precious". Larcenet's art is cartoony and expressive. His characters are stubby, knobby creations with big noses, often flitting in and out of darkness. Larcenet is the master of the pregnant pause, stretching out narratives with silent story beats that allow the audience and his characters to really chew over what's been said and done. Another interesting device he uses is devoting entire pages to Marco's photographs, accompanied by Marco's deepest thoughts on matters that trouble him. 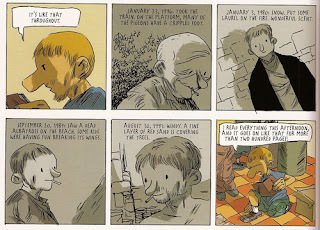 These monologues have a powerfully lyrical quality to them that show how much studying his own work enables Marco to process and come to terms with the world. Larcenet is witty and varies the mood of the piece so that it became neither too introspective nor too slapstick. That wit shines through in his drawing as much as it does in the dialogue. There's a warmth in Larcenet's work that welcomes the reader in, but the questions he raises offer a challenge as well. 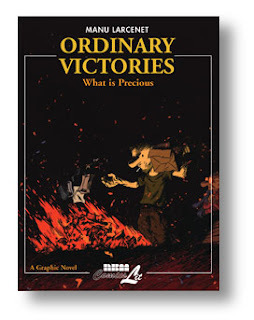 We don't just read of Marco's life, we find ourselves asking the same questions he did, and that's why Ordinary Victories 2 lingers in one's mind long after it's been read.